Export Profiles make it easy for you to pre-select the specific information you want displayed in your reports. After you generate a report and click the Custom Report button, you're given the option to Choose an Export Profile. Creating and saving these Export Profiles in advance will make it simple for you to get the information you need every time you generate a particular report. From the Operations section of your dashboard, navigate to Reports > Export Profiles. Click Add New Export Profile. Enter a name for your Custom Export Profile Title. Select your Report Type from the dropdown menu. Since there are various types of reports, the Report Type you select for your Export Profile needs to match the report where you will use it. 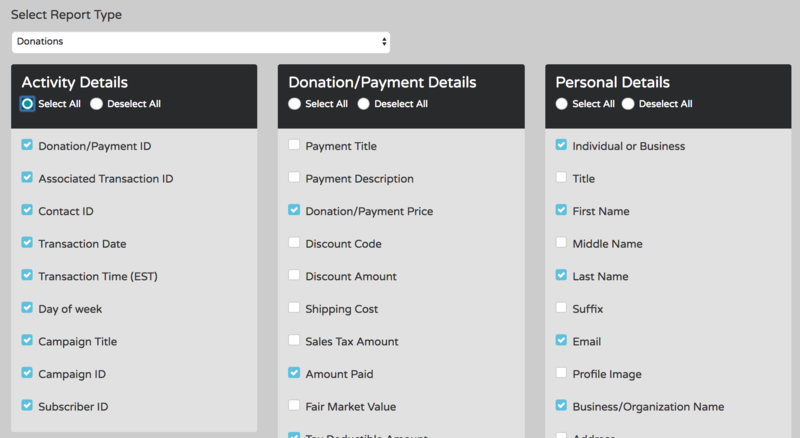 For example, if you want this Export Profile to appear in the dropdown menu for a Donations Report, you'll need to select Donations as your Report Type in this step. Note: the fields available in the next step will be based on the Report Type you've selected. From here, you'll see all of the fields in this Report Type. Use the checkboxes to select individual fields for your Export Profile, or use the Select or Deselect All to choose entire sections. Don't forget to hit Save Changes at the top! Create as many Export Profiles as you need and use them to create your Custom Reports. Once saved, they will appear in the Choose Export Profile dropdown list.